In the mid-1990s, I spent 4 years working in the New York Giants’ strength department with Al Miller, their head strength coach at the time. During those years, I also spent some time working with Coach Al Vermeil in the Chicago Bulls’ strength department. Coach Miller has gone to the Super Bowl five times, and Coach Vermeil won six championships with the Bulls, so we can assume that these two coaches know something about conditioning. Together, the two of them developed a conditioning program (Figure 1). This conditioning pyramid has at its base six categories: aerobic conditioning, anaerobic capacity, core strength, joint mobility, strength endurance, and body composition. These six categories represent the very foundation of conditioning, and it is mandatory for all players to begin their conditioning at this level. 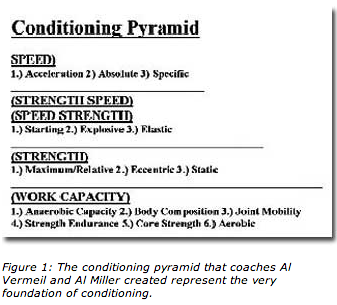 Figure 1: The conditioning pyramid that coaches Al Vermeil and Al Miller created represent the very foundation of conditioning. When a player joins either of these teams, either through the draft, free agency, or a trade, he is required to prove himself in these six categories before he can enter the weight room. Every athlete on these teams must be able to pass certain tests in these categories before they can introduce weight to their structure. Miller and Vermeil both proclaim that this is the beginning of injury prevention. In most states, all student athletes are required by law to complete testing before they can participate in sports for the year. Although this sounds very protective and appropriate, it in fact is thoroughly inadequate. The standard exam (Figure 2, page 32) required by each state is a medical exam—starting with the eyes, ears, nose, and throat—and ends with a paltry structural exam, the performance of the Adam’s Test for scoliosis. The corresponding line for scoliosis says, “Scoliosis: positive_________ negative_________,” as though scoliosis is the only condition worthy of notice in the spine. 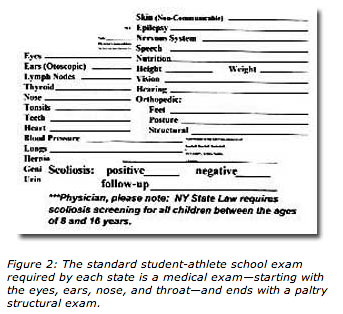 Figure 2: The standard student-athlete school exam required by each state is a medical exam—starting with the eyes, ears, nose, and throat—and ends with a paltry structural exam. The child who passes this test is then put through demanding conditioning, training, and participating in his or her respective sport. Children as young as middle-school age are entering the weight room these days to begin their long journey of conditioning. Added to the fact that no one performs any type of thorough structural exam on these children is the issue of proper guidance in the weight room. While with the Giants, I witnessed Coach Miller individually bark out individual commands to each and every player, based on the accumulation of knowledge the team had gained during the prep phase with each athlete. At our local middle and high schools, either the coach, a gym teacher, a parent—or no one—watches our kids. With the competitive nature of youth and their desire to show how strong they are, it doesn’t seem illogical that improper weight work will occur. The trainer will evaluate the child and make recommendations, and, if the condition is severe enough, refer the child to the local orthopedist or to the child’s primary health care provider. At this point, the child is caught in the loop of seeing doctors and therapists who have no idea of biomechanics, the cause of the injury, the degree of the injury, or the course of action that should take place. The trainer, who is overwhelmed with too many responsibilities, will make a simple recommendation, ignoring the need for further, appropriate follow-up. The long-term concern is that degeneration of the human frame is caused by imbalances in the structure, which, over time, become fixated joints. Eventually, this young person becomes an adult with an accelerated degenerative process that is taking place in his or her body. Of course, our health care industry has made it almost commonplace for aging athletes to require some level of care for their aching, worn-out joints. These treatments range from medications (such as anti-inflammatories, corticosteroids, and hyaluronic injections) to surgeries (such as arthroscopic, bone fusion, and joint replacement). Not only do they provide answers once the joints have worn beyond a certain point, but this has become a tremendously profitable industry. And this is OK with everyone? Personally, I am outraged at the collective negligence that is allowed in the supposed protection of our pediatric population today. It is ignorance (lack of appropriate examination), followed by more ignorance (not recognizing the importance of strategic and safe conditioning), followed by ultimate ignorance (waiting for a person to rot out and then provide radically expensive crisis care). Approximately 1 year ago, I contacted Jerry Diehl, president of the National Federation of High School Sports, and told him about the critical void that existed in our middle and high school conditioning programs. After a brief pause, he stated that the federation is aware of the void, but is unaware of how to address it. I have continued my dialogue with Mr Diehl in an effort to solve this crisis. Structural exams must be performed on all children wishing to participate in sports today, prior to the beginning of the season. Structural exams can be performed without x-rays, until the child turns 12 years old, when appropriate standing x-rays need to be taken. This exam detects structural imbalances, weaknesses, and distortion patterns. It is ideally performed on nonsymptomatic patients; however, it can also be performed on the injured. As many of our young athletes are under the age of 12, structural x-rays should only be considered if they are clinically warranted. Once a child reaches age 12, standing structural x-rays need to be taken to determine the starting point for that child. The x-rays provide 75% of the information needed. They allow the examiner to determine biomechanical distortions and imbalances, as well as many other possible findings. Assuming that the examiner knows how to biomechanically interpret the information on the x-rays, this information contributes greatly to the conditioning recommendations for this child. In addition to the exam and x-rays, examination of the feet and knees is crucial. Most children will pronate (have flat feet) prior to age 7 or 8. Once a child is past age 8, the medial arch he or she presents with is considered to be the arch he or she will live with. Since the majority of the population pronates, the odds are high that there will be some possible pronation involvement. Prior to age 12, custom-made orthotics should be considered, as body balance and efficient joint mobility is the prevailing goal. Once a child reaches age 12, a complete examination should take place, including x-rays, and the child should use adult orthotics for the shoes. 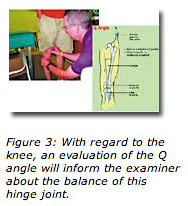 Figure 3: With regard to the knee, an evaluation of the Q angle will inform the examiner about the balance of this hinge joint. With regard to the knee, an evaluation of the Q angle (Figure 3, page 34) will inform the examiner about the balance of this hinge joint. This angle represents the angle formed by the quadriceps tendon as it travels over the patella and then attaches to the tibial tubercle. In the textbook case, pronation of the corresponding foot will often produce an increase of this angle. Unfortunately, an increased Q angle can also not be textbook, showing positive when least expected and negative when expected. Therefore, it must be examined—both knees on all patients—to know the status of this test. Research has shown an associated increase of many knee injuries when an increased Q angle is present, and the addition of custom-made orthotics to the equation will reduce the stress in the knee caused by the imbalance. If all active children could receive this evaluation and the supportive care needed, the number of injuries in youth sports would be drastically reduced. The amount of future joint degeneration would also be reduced, altering the course of many people’s lives. This approach might also put a dent in the profitability of modern medicine. It is incumbent on all of us to demand a change in the way kids enter the sports arena. Structural exams should become mandatory, and the standards used by coaches Miller and Vermeil should also be used for the thousands of young athletes today. Until we raise the bar and demand such a change, it is unlikely anyone will see to it that this happens. Timothy J. Maggs, DC, specializes in sports and industrial injury management and is a graduate of the National College of Chiropractic. He writes and speaks at numerous engagements.